Working closely with Omobono, the global creative and technology agency for business brands, we were tasked to create something visually whizz-bang-ping! (Fuse for “stunning and attention-grabbing as a high end corporate communication”). Accenture wanted to announce the intorduction of their new services and their partnership with Salesforce. The campaign (and the product itself) would also serve as an invitation to a prestegius upcoming event. The brief specified the inclusion of corporate video (which could be watched there-and-then, on the spot, along with a subtle play on words with the inclusion of some custom branded white chocolate and rasberry cookies to deliver their “outcome is sweet” messsage. So, a custom designed, rigid-board VideoPak presentation box was created. Ihat was printed using Omobono’s expert vision of a pantone metallic gold flood base, with a vibrant pantone pink that really popped! Coupled with the touch sensative spot gloss and intricate emboss, the finish was a truly world-class, premium finish in the hands. 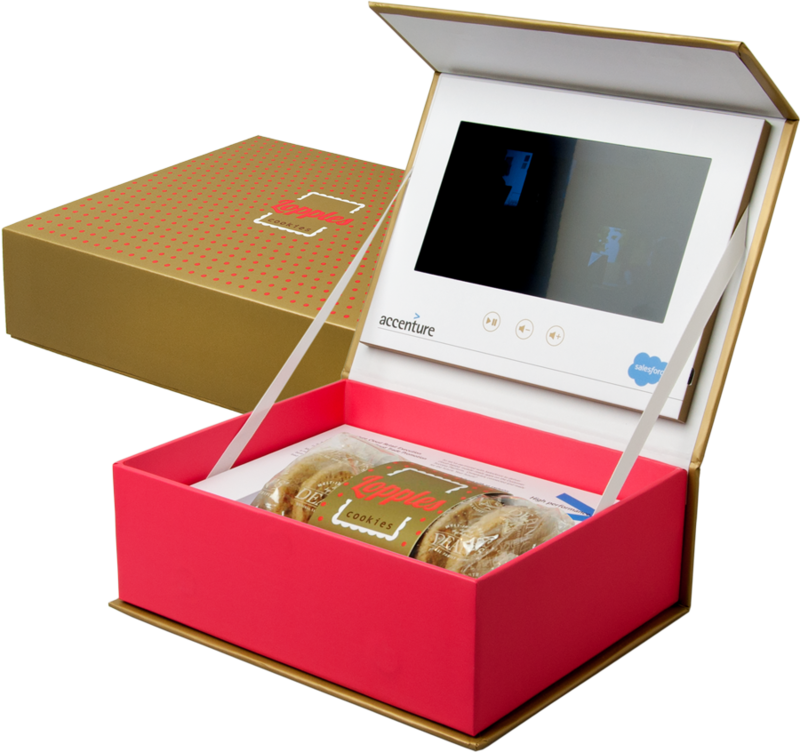 We produced the box and sourced the cookies and custom branded them. We also provded the protective outer mailer box and the global distribution of the VideoPaks, safely into the hands of the eager recipient who watched the video, enjoyed the delicious cookies (probably with something hot and caffeinated) and responed by the trackable unique URL provided as a way of measuring the ROI. A job well done!